Ken Anselment, Dean of Admissions, and Caro Granner ’20, co-host our 5th Annual Live Show. This three-hour primetime experience is jammed packed with all of the things you know and love about Giving Day, featuring many activities, performances and guest appearances. 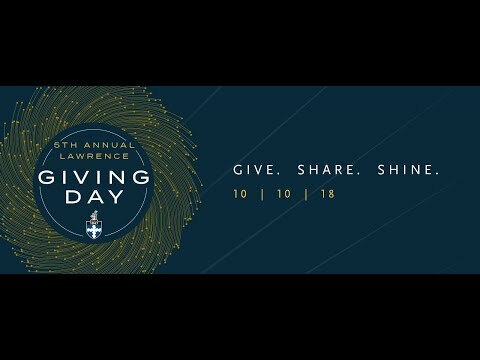 Giving Day hosts Ken Anselment, Dean of Admissions, and Caro Granner '20 will help us kickoff our 5th Annual Giving Day with a special feature and announcement from Mark Burstein. Join us live in the Flume Room with Professor of Geology and Special Assistant to the President, Jeff Clark. Don't know what the Flume Room is? You will not want to miss this behind the scenes tour of this amazing hands on lab. Tune in to see three current students take on three LU professors in Unusual Lawrence Trivia. You can play along in the comments on Facebook and also see who will be crowned the winner! You are in for another great show with faculty, students, alumni and more! Below you will find the special guests you can expect to see within each hour. They are approximately in chronological order, but with a live show, you just never know what will happen! Enjoy!